Texas Game Wardens and Park Police Officers are commissioned peace officers and file court cases with a variety of courts, depending upon the individual location and situation. Court clerks and officers alike use a variety of tools to classify and dispose of those cases. Some of those tools are contained here. The law enforcement officers employed by the Texas Parks and Wildlife Department have the same powers and privileges as any other state peace officers. They have the same authority as a sheriff, for instance, to arrest, serve criminal or civil process, and require aid in serving criminal or civil process, and may arrest without a warrant any person in this state for violating the law. The primary duty of the agency’s law enforcement personnel is to enforce statutes (for example, the Texas Parks and Wildlife Code and the Texas Penal Code) enacted by the Texas Legislature, as well as regulations (sometimes referred to as “proclamations”) enacted by the Parks and Wildlife Commission under authority delegated by the legislature. In addition, Texas game wardens hold federal commissions issued by the U.S. Department of the Interior and the U.S. Department of Commerce for purposes of enforcing federal fisheries and wildlife laws in Texas. The Interstate Wildlife Violator Compact is an agreement that recognizes suspension of hunting, fishing, and trapping licenses in member states. This means that illegal activities in one state can affect a person’s hunting or fishing privileges in all participating states. Any person whose license privileges or rights are suspended in a member state may also be suspended in Texas. If a person's hunting, fishing, or trapping rights are suspended in Texas, they may be suspended in member states as well. This cooperative interstate effort will enhance the Department’s ability to protect and manage our wildlife resources. The Interstate Wildlife Violator Compact also establishes a process whereby wildlife law violations by a non-resident from a member state are handled as if the person were a resident, meaning they can be served a ticket rather than being arrested, booked, and bonded. This process is a convenience for hunters, fishermen, and trappers of member states, and increases efficiency of Game Wardens by allowing more time for enforcement duties rather than violator processing procedures. Texas honors similar wildlife violation suspensions from other member states. This would include Failure to Appear in court violations. If a non-resident sportsman is issued a wildlife citation and fails to comply with the citation or appear in court, the Department will notify their home state of a Failure to Comply. The home state may then suspend that person's resident hunting or fishing license. Once the sportsman complies with the Texas violation, their home state will be notified and their resident license will be reinstated. 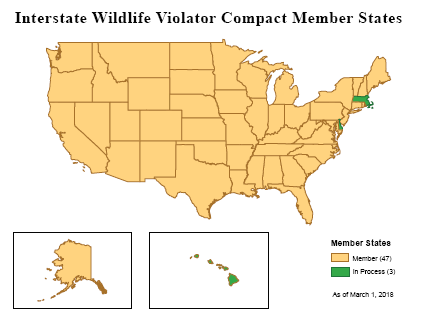 The concept of a wildlife violator compact was first advanced in the early 1980s by member states in the Western Association of Fish and Wildlife Agencies. Law enforcement administrators and Wildlife Commissioners from several states began discussing the idea of a compact based on the format of the existing Drivers License Compact and Non-Resident Violator Compact, both of these related to motor vehicle operator licensing and enforcement. During the 1989 legislative sessions, compact legislation was passed into law in Colorado, Nevada, and Oregon. These three states formed the nucleus of the Compact. Texas joined in late 2009.